When I set out to design a unisex, all-ages neckwear “accessory,” the first thing that came to mind was cables. But when facing the prospect of knitting them into a boring scarf shape, I was less enthusiastic—and so, an asymmetrical shawl was born! 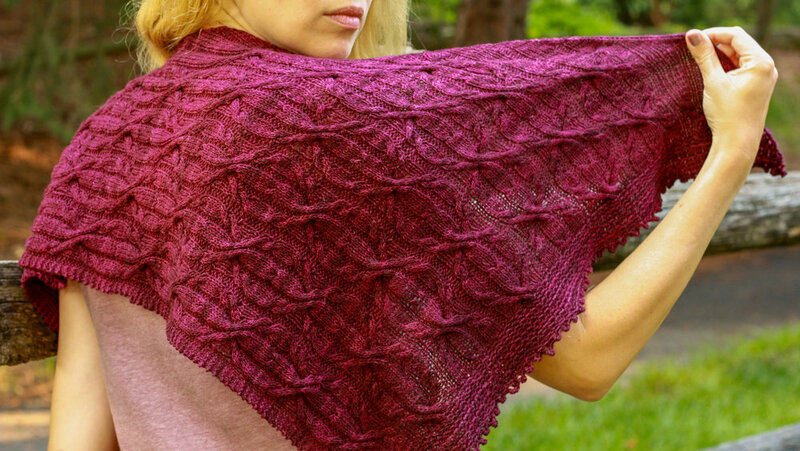 Worked from one point outward, the Greenbrier shawl features a repeating cable motif, trimmed with a modified garter stitch pattern along the opposite side, and finished with a fun picot bind-off. Shawls don’t work as well for people on the move, especially little ones—they’re liable to fall off and get lost. So I’ve included a stay-put cowl version as well. 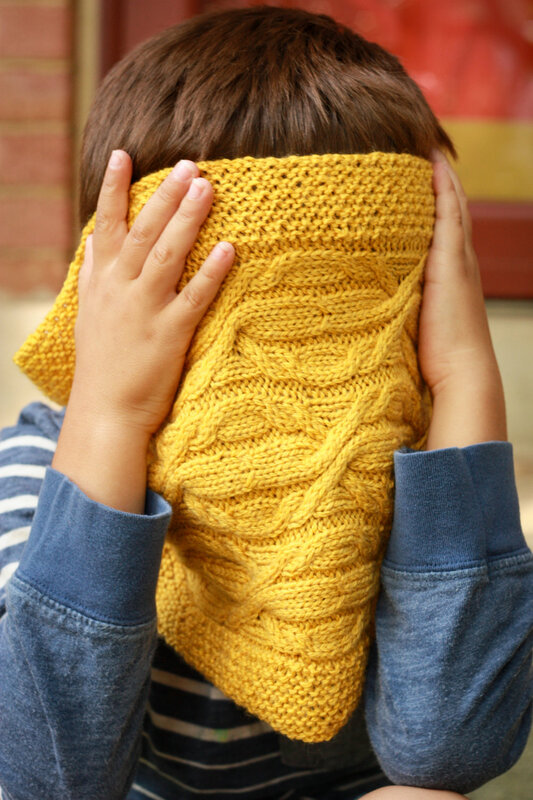 The Greenbrier cowl features the same cable motif, and is worked flat and seamed so the cables wind horizontally around the neck and you can easily work it to the exact circumerence you want. Exact gauge is not essential, but any differences in gauge will impact the finished dimensions of the project, its drape, and the amount of yarn used. Shawl: Backyard Fiberworks American Wool – Cormo 2016, 100% wool, 538 yd/3.5 oz (492 m/100 g): 1 skein in Plume. Cowl: Pichinku Yarn Tawa, 70% merino wool, 30% silk, 436 yd/3.5 oz (399 m/100 g): 1 (1, 1, 1, 2) skein(s) in Golden Chicha. Note: even if you usually cable without a cable needle, you may want to have one to work the large 6/6 LC.